Samsung Galaxy Note 4 specs leak out – Wow! 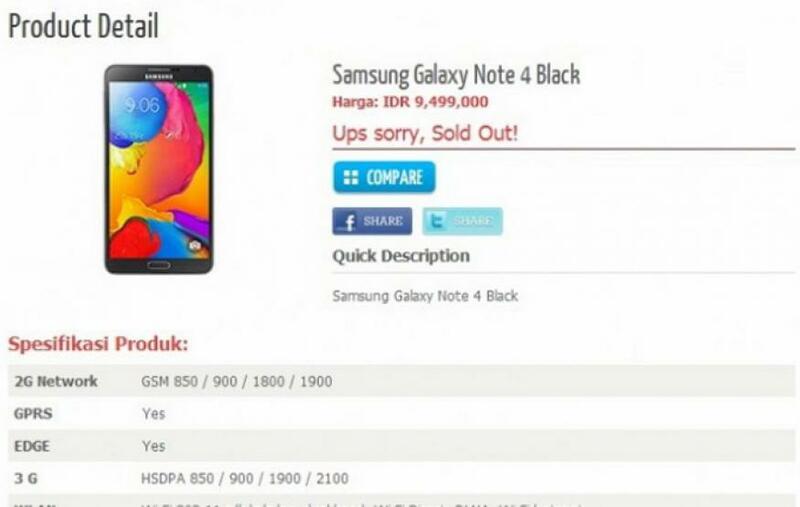 Indonesian retailer Erafone appear to have spilled the beans on Samsung's upcoming Galaxy Note 4. A dedicated product page revealed the phablet will boast a 5.7-inch 2560×1440 quadHD display, 4 gigabytes of RAM and a quadcore 2.5Ghz Qualcomm Snapdragon 805 processor or octocore Exynos 5433 depending on the region. In addition, the Note 4 will have a 16 megapixel camera with the ability to record 4K, dual-band Wi-Fi, Bluetooth 4.0 and run Android 4.4.3. The phablet will be available in 16, 32 and 64 gigabyte varieties, which can be expanded via microSD. Based on these specifications, the Note 4 will certainly be an impressive device. While the asking price of 9,499,000 rupiah may simply be a placeholder, it converts to AUD$869 or USD$813. The product page on Erafone has been removed. Samsung is expected to officially announced the Galaxy Note 4 on September 3. Click here for alleged photos of the device.